If your car needs repair after an accident or incident, you don't have to use your insurer's approved repairer. Autospray Solutions will provide the highest quality bodywork repairs to meet all your insurance requirements. When making an insurance claim for your vehicle to repair the damage you can choose your own insurance approved repair centre to carry out the repairs. Autospray Solutions can offer a same day repair service, which is ideal if you aren't issued with a courtesy car. If your repairs will take longer than a day, our collection service can pick up and drop off your vehicle at a time to suit you. We know that it can be stressful dealing with insurance companies, so at Autospray Solutions we take care of this for you by sending a quote for approval before work is started. Our staff are paid a salary. We don't believe in working to bonus targets as this may lead to cutting corners and losing the quality of repair. Why use Autospray for your repairs? Choosing Autospray for your insurance repairs will put you at ease, knowing that your insurance approved body repairs are being carried out by a local, trusted repair centre. Autospray Solutions are an insurance approved body shop offering services around Maidstone, Medway, and Kent. Our high-quality services are carried out by highly trained and experienced repairers who ensure that all our body repairs are done to the highest quality. 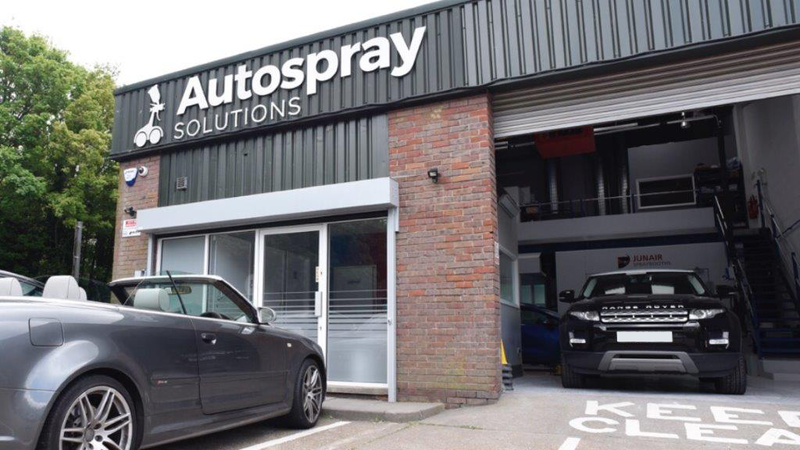 When you choose Autospray Solutions as your insurance approved repairer, you won't have to worry about getting to and from our state of the art workshop, as we can offer a collection service for your vehicle. If you have been involved in an accident and your vehicle needs repair work done to it, ask your insurer to use Autospray Solutions to get the job done. We offer a fast, reliable service and offer fair and accurate quotes. Contact us today to receive a free no obligation quote. To save you the hassle we will even send the quote to your insurer for approval, making the process of getting your car back on the road a much easier task. Our convenient mobile body repair service can be carried out at using a SMART (Small to Medium Area Repair Technology) repair system. All of our mobile insurance repairs are fully guaranteed. Our SMART insurance approved mobile repair system allows us to carry out repairs on your vehicles at a convenient location for you. We offer a fast, friendly, and reliable service. Our state of the art insurance approved repair workshop is fully equipped with the latest technology, which ensure that our services are efficient and perfect every time. Our workshop is based in Aylesford and we offer a full range of repair services. Autospray Solutions offer fast, reliable, same day insurance approved body repairs. This means that you can be back on the road on the same day. If your insurer doesn’t offer a courtesy car this service is ideal. We also offer a vehicle collection service for longer insurance approved repairs. All of our insurance approved body repair are carried out by fully qualified and experienced repairers. Autospray solutions are an ideal choice for an insurance approved repair as we are certified by the BSI Kitemark. What is the BSI Kitemark? The BSI Kitemark means that we have to meet certain standards on all aspects of the repair such as only using good quality tools and parts for all of our work. The BSI Kitemark also ensures that all of our staff are fully qualified and trained so that excellent standards are always met. All repairs made under the BSI Kitemark have to be made safe, meaning that there is no hazard with any of the repairs and they are safe to use for everyday use. The BSI Kitemark ensures that quality is always maintained throughout all of the repairs we do. This means that we only use top quality tools and parts to make sure that your insurance approved repair meets the standards set by BSI and your insurer. To ensure there standards are constantly met BSI hold unannounced inspections. To ensure all of our insurance approved repair quotes are as accurate as possible we use Audatex Global Claims Assessment Systems. This gives us an accurate quote for the work to be carried out on your vehicle which we can then send to the insurer for approval. Audatex quotes are trusted by insurers to give a fair and accurate price.